2018: Chair of the NWO TOP1 & TOP2 grant selection committees for mathematics, computer science and astronomy. 2016: Chair of the search committee for a tenure track assistant professor in Artificial Intelligence, focus area Neurocognitive Modeling. 2011-2017: Chair of the Board of Stichting COGSYS, Groningen. 2012: NWO Selection Committee VENI Computer Science. 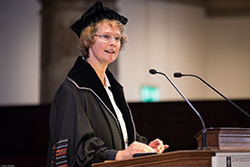 2005-2014: Chair of the Vereniging voor Logica en Wijsbegeerte der Exacte Wetenschappen VvL (Netherlands Association for Logic). 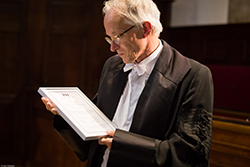 On September 26, 2014, Rineke Verbrugge appointed Prof. dr. Johan van Benthem as honorary member of the Association for Logic, on the occasion of his valedictory lecture in Amsterdam. 2007-2010: NWO Program Committee Cognitive Science. 2005-2009: Curriculum Committee BSc and MSc Artificial Intelligence and MSc Human Machine Communication. 2004-2009: Admissions Committee of the Master Artificial Intelligence.